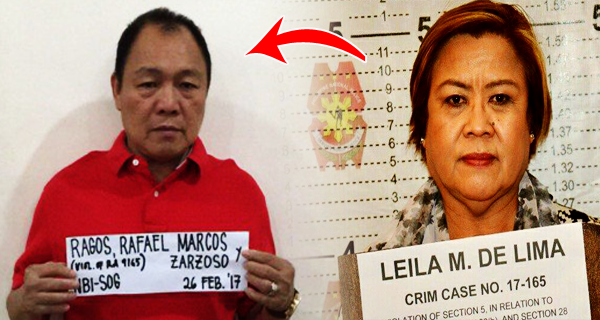 BREAKING NEWS: Ex-Bucor chief gagawing state witness ng mga prosecutors laban kay De Lima! CurrentScoops November 16, 2017 Administrasyong Duterte, BREAKING NEWS, Detained senator, Ex-Bucor chief, Executive Judge Juanita Guerrero of Branch 204, Former Bureau of Corrections officer in charge, Leila de Lima, Muntinlupa City Regional Trial Court, politics, Rafael Ragos, Senior Assistant Prosecutor Ramoncito Ocampo Jr. The prosecutors in a motion to the court on Thursday, said they would like to Rafael Ragos, the former Bureau of Corrections officer in charge, as a co-respondent in one of the illegal drug cases filed against the detained senator and Ronnie Dayan, her former bodyguard-driver. “We have asked the court for the dropping of Ragos as one of the accused… We will utilize him as a prosecution witness,” Senior Assistant Prosecutor Ramoncito Ocampo Jr. said. The detained senator is scheduled for Tuesday to enter her plea before Executive Judge Juanita Guerrero of Branch 204 of the Muntinlupa City Regional Trial Court. Senior Assistant Prosecutor Ramoncito Ocampo Jr.
Labels: Administrasyong Duterte, BREAKING NEWS, Detained senator, Ex-Bucor chief, Executive Judge Juanita Guerrero of Branch 204, Former Bureau of Corrections officer in charge, Leila de Lima, Muntinlupa City Regional Trial Court, politics, Rafael Ragos, Senior Assistant Prosecutor Ramoncito Ocampo Jr.